So why is he not more of a celebrity in the music world? The answer is simple: because not all of these performances have been in recital, but rather with the Zurich Opera Ballet’s production of the Goldberg Variations choreographed by Heinz Spoerli. As we sit down in the lobby of his downtown Athens hotel, I mention that the first time I saw this ballet at Deutsche Oper in Berlin, the person sitting next to me inquired who ‘the gentleman in the suit’ was when he joined the dancers on stage to take his bows... and I remember being hard put to concentrate on the ballet when I realized what an astonishing live performance of this fiendishly difficult piece was coming from the orchestra pit. First, however, we go back to the beginning, when he was growing up in a family of musicians in Odessa. Did he know all along that he wanted to become a pianist? “Certainly not, and I was no child prodigy,” he says dismissively, although in fact he gave his first public recital at only 13 and performed Prokofiev’s piano concerto no.1 at the age of 15 (so that the definition of what a prodigy is would need to be fairly restricted for him not to qualify). “My parents never pressured me, and I played football and did all the things children normally do. Then, having moved on from Odessa to the Moscow Conservatory, he was a winner and the youngest entrant at the Rachmaninov-Competition, held every 2-3 years at the time, and attracted a fair amount of attention. “Competitions are more about sport than about art, I’m afraid, but they are a useful way of winning recognition, and besides, it seems to me that 20-something years ago they were still fairer and the winning titles were more significant, which is why I went on to compete and win at the eighth International Bach-Competition in Leipzig and the very first Clara-Schumann-Competition in Düsseldorf. 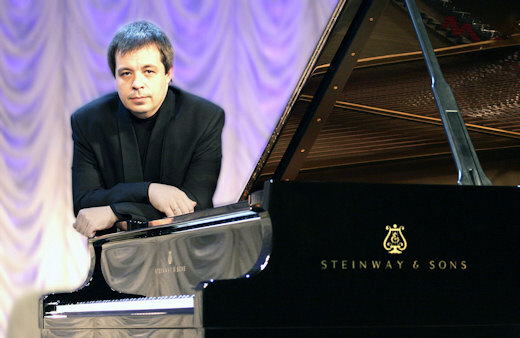 Bach has dominated our conversation, owing to the performance here in Athens, and therefore it important to point out that Alexey Botvinov is also one of the most acclaimed performers of Rachmaninov worldwide, and his broad repertoire features over 30 piano concertos, including rarely played works such as the Prokofiev concerto no. 2. So one can only hope to hear much more from him in concert halls in future, and for a look at his discography, including not only Rachmaninov, but also Chopin and Brahms’ Händel-Variations, visit his website at www.botvinov.com. What’s more, the intriguing Swiss film “Vitus” (you guessed it - the story of a child prodigy pianist) features part of his recording of the Goldberg Variations, which, by the way, was made in one single take. You can’t get much more prodigious than that.